LiU’s international team has returned to base after an intensive autumn of recruitment. They visited education fairs in 20 locations in seven countries to promote LiU’s master’s programmes and meet LiU alumni on location. It was hectic but fruitful. The three members of the team from the Communications and Marketing Division brought back with them contact information from over a thousand prospective students who would like to receive more information about programmes at Linköping University. 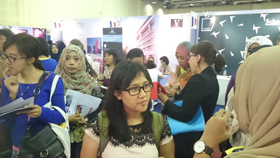 Turkey, China, Great Britain, Mexico, South Korea, and India and also Indonesia – a new country on LiU’s international recruitment circuit (pictured, right). “We took part in a fair there that was organised just for European programmes,” explains Therese Winder, communications officer in the Marketing Unit. “A lot of people want to study in countries where English is the mother tongue. So people interested in going to countries like the United States and Australia don’t come to this fair. 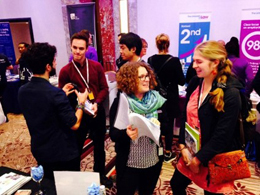 In London, LiU took part in a new fair specialising in master’s courses. The two best universities in the UK were there and they acted as a magnet. “In Great Britain they charge fees for study, even to domestic students. That’s why we’re putting in some work here. It is also good for LiU programmes to find students with English as their mother tongue,” Ms Winder explains (centre of picture, right). Many of this year’s international alumni gatherings, including in Turkey (pictured, below right) and in Mexico, were well-attended. The gatherings not only give LiU the opportunity to update alumni about what is happening in the university, but it also gives the former LiU students the chance to expand their local network. “It’s also fun to hear how many of our alumni are working in areas directly linked to the courses they took at LiU,” says Margareta Alfredson, international marketing officer. Internationally, alumni activities are very significant. The alumni act as a link between the professional world and the university, and as a network out in the working world. What impact does the international marketing have? “More and more students are coming each year, compared with the low point of 2011 when fees were introduced. Perhaps the numbers are not so high, but they are moving steadily upwards,” Ms Winder says. “Competition for students is stiffening. If you want to be a player on the market you have to keep up. We have no choice if we want to be a university with an international reputation,” says Ms Alfredson (picture right). As a part of the international recruitment strategy, LiU also works with recruiting agencies. LiU has marketing and student recruitment agreements with seven agents: three in China, two in India and one each in Indonesia and Pakistan. “They are our long arm, functioning more or less like a broker. They are on the ground, know the local market and culture, understand the students and speak their language,” says Eva Lena Rodriguez, project manager in the Marketing Unit.